Providing drinkable water for soldiers in the field has always been essential, but current technology doesn’t always allow for the quick detection of a wide variety of possible toxins. Due to the efforts of the U.S. Army Medical Material Development Activity’s Medical Support Systems Project Management Office, a more advanced system will soon be available. 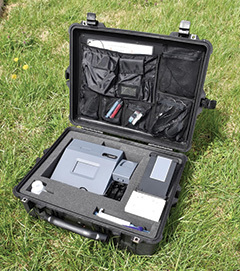 The Environmental Sentinel Biomonitor is a portable system for screening water for a wide range of possibly toxic industrial chemicals. It will soon be an important part of the Water Quality Analysis Set - Preventive Medicine which is currently fielded to preventive medicine technicians who test for bacteria and hazardous materials to verify toxic industrial chemical levels from current filtration methods. Right now, reverse osmosis-based treatment systems are in use and are highly effective in removing most chemicals. However, some chemicals still manage to get through. “Most of the current technologies are analyte-specific [look for individual chemical substances] rather than broad-based,” said Alan Harner, MSS PMO product manager. Thus, until now, testing for those chemicals was limited to looking for only a few pre-defined elements at a time per test. Additionally, the spectrum of toxins delineated needed to be redefined. An extensive list was compiled by a team of experts at the U.S. Army of Public Health Center (Provisional). These items were then narrowed down to 18 different chemicals that are representative of that list. The resulting items consist mostly of pesticides and heavy metals. The ESB doesn’t identify the specific chemical it detects; it just alerts the user as to its presence. A positive result simply alerts the user the water is unsafe to drink. “The ESB provides added force health protection for our deployed Soldiers, while also supporting homeland security through rapid testing and detection of toxic chemicals in drinking water,” said Steve Hawbecker, MSS PMO project manager. Currently, there are only a few toxic industrial chemicals that can be tested in theater. All other water samples must be sent back stateside for analysis, where the wait for results can take up to 19 days. The new ESB is very efficient, as the onsite testing takes only 90 minutes from start to finish. The ESB, which only weighs 28 pounds, consists of two individual sensors used to complete the process of identifying the presence of chemicals. The first is an electric cell-substrate impedance sensing device, which uses non-human living cells to test for toxicity. The second device is the ACE Rapid Test for Acetylcholinesterase Inhibitors that looks for pesticides in the water. The ESB technology, having already been tested by preventive medicine technicians in the field, is ready to go. “The product will soon be procured and then sent to units in the field,” said Harner. As the Water Quality Analysis Set-Preventive Medicine is distributed to troops here in the U.S., Soldiers who have not yet been deployed have the ability to use the ESB right here at home. Whether it is used overseas or stateside, the ESB will be an essential addition in protecting Soldiers’ health and enhancing homeland security.